Two more of 1/24’s veterans have passed away in recent weeks, bringing the (known) number of 2014 passings to six. Alfred Eskildsen, known (naturally) as “Esky,” passed away on June 24, at the age of 91. Born to Eskild and Anna Larsen on March 15, 1923, “Esky” was raised in Stambaugh, Michigan, in a huge family of twenty siblings. His older brother William joined the Marines before the war, and on September 11, 1942, Esky followed in his footsteps. The nineteen-year-old became a machine gunner in Second Platoon, Company D, and first saw combat on the island of Namur in February, 1944. There, he had an unexpected reunion with Platoon Sergeant William Eskildsen, whose 15th Defense Battalion moved in to garrison the islands. Esky was then reassigned to Company B. His MOS changed from that of machine gunner to automatic rifleman, and he fought for two days in the battle of Saipan before a serious leg wound sent him to Fleet Hospital #108 on Guadalcanal. By October, PFC Eskildsen was back with his company and training for the invasion of Iwo Jima – he had a happy reunion with his foxhole buddy, PFC Charles Earl Brown. Eskildsen was wounded a second time on Iwo Jima – once again, only two days into the battle – and was sent back to the hospital at Aiea Heights, Hawaii. It was the end of his combat career, and Esky remained under medical care until his discharge from USNTC Great Lakes on October 31, 1945. While recuperating in Chicago, Alfred Eskildsen met Betty Laurienc; they were married in 1946. He began a career as a carpenter, and in 1954 relocated to Peoria to work for Chuck Brown Builders, a company headed by his old foxhole buddy. The Eskildsens made Peoria their home for the next sixty years, raising a family while Alfred grew to love bowling, dancing, barbecuing, and hunting with his brother Herb up in Montana. Betty Eskildsen passed away on June 9, 2014, and Alfred followed just two weeks later, on June 24. Such was the atmosphere in which Carroll left for war. After completing his training, he was assigned to Company B, 1/24, and within four days was on his way to combat on Namur. Private Stout served as a rifleman in the Marshall Islands, on Saipan (where he was slightly wounded) and on Tinian. In the fall of 1944, he was reassigned to battalion headquarters to serve with the medical detachment as a combination warrior and stretcher bearer. 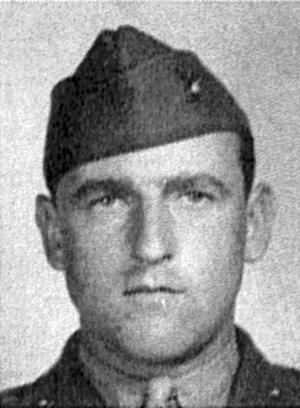 Stout was wounded in action on March 8, 1945, and sent to Hawaii to recuperate. He spent the remainder of the war with the 6th MP Battalion in Hawaii, and was discharged with the rank of corporal on January 5, 1946. Following the war, Stout returned to Johnson County and was content to live out the rest of his life there, working for Burlington Industries and raising a family with his wife, Alice. He passed away on July 12, 2014. Semper Fi, Marines. Rest in peace.